If I were asked, as I am being asked now, which book I would take with me to a ‘new world,’ brave or cowardly, I imagine, I would struggle to deliver a prompt answer, certainly not before due consideration. Not the considerations you probably think I mean though. ‘Ohhh, which book did I first rush off to the meadow with and skin each page off like a maniacal butcher makin’ bacon?’ Or, ‘from which book did I first recite from to my true love over the winking bulbs of a candelabra?’ Those are not them. No. These are not the questions I would pose to myself. Firstly, I would need to recognise and evaluate which particular form of duress encouraged my departure. Be in nuclear holocaust, cultural genocide or some recent or imminent natural disaster. Some stipulate no return, whereas others could mean a short camp-out on the moon reading about James Herriot and his veterinarian exploits in the 1940s and 50s. If I were to leave, giving earth – my native planet and nurturing celestial custodian, the only planet in our reach with an amenable atmosphere – one last overlong glance and wistful goodbye, before snapping my head forward to regard an as yet anonymous and potentially hostile land (tucked somewhere in the folds of darkness beyond me and the windscreen of whatever machine I’ve been able to make with my limited engineering aptitude) I would need to select a book of some utility I’d imagine. Okay, where are we getting with this? Definitely not away from that looming wave that began the conversation. Maybe the next question would be, asked very quickly with a scan of my surroundings, how many people am I travelling with? Say there’s a few, perhaps the best book to take would be the latest edition of the truly seminal Gray’s Anatomy. I’m no surgeon, but I can learn – and in a new world without survivors trained in medicine, someone might have to step up to the makeshift scalpel and cut that big human teddy open and see whassup. 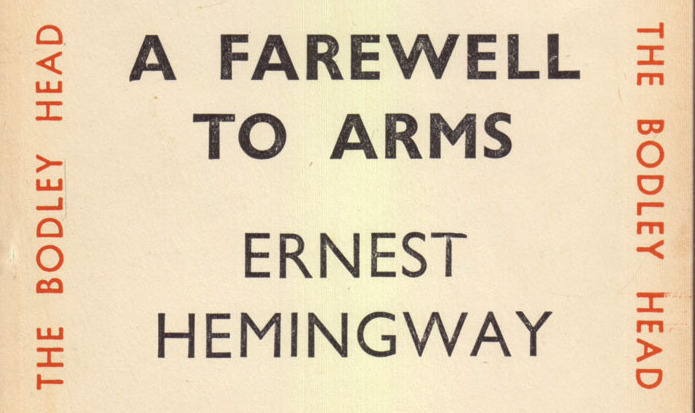 Hemingway’s (people who know me will be choking back the Iknewit’s) A Farewell to Arms. Why, you ask. Why I shall you tell, friend dear. Maybe it’s because the copy I read was my dad’s from when he was 16, or maybe what got me was its muscular economy of style. Or its exhibition of naked human principles, usually reserved for human relationships of the truest and bravest kind, and with that the ones most fragile; ones so often met, as the one in Farewell to Arms is, with devastating tragedy of whatever species. My response to its end threatened my implacable masculinity, but then Bradley Cooper threw the very same book out of the window with grief in that film he’s in with JLaw Katnip. So he confirmed that all the big boys do it. My tear(s) was (were) not mis-shed. Jamie Delves is best to be avoided. That is, if you’re not avoided by him. Paradoxically, Jamie is an enigma and a celebrity. In the right circles. Of course. I read this article and found it very interesting, thought it might be something for you. The article is called A Farewell To Arms – #newworldnovel and is located at http://prancingthroughlife.com/2015/03/11/a-farewell-to-arms-newworldnovel/.